iPage was founded in 1998 as a full web-service provider. However, in the next ten years, the company evolved into a web hosting provider. In 2009, they were bought out by the Endurance International Group, which owns a few other well-known web hosts. Environmental responsibility is a hallmark of iPage. They are 100-percent wind powered and websites or blogs they host are eligible to display an iPage Green Certificate on their sites. Being eco-friendly is always a plus. So are they really good, or do their promises add up to a lot of hot air? At first glance, it appears that iPage only has two kinds of hosting, but if you scroll down, you’ll see the standard types of hosting plans. Shared hosting, called the iPage Essential Plan, is the only shared-hosting plan offered. However, with this plan, you get unlimited domains, disk space, and bandwidth. But beware of the unlimited bandwidth claim. The company states that 99.5 percent of their customers are fine with this plan and bandwidth. However, iPage also says, “some customers become so successful that their traffic and data transfer outgrow our shared architecture.” In this case, the customer will be offered other solutions, such as VPS hosting. VPS hosting is available in three plans. Basic: 1 core CPU, 1GB RAM, 40GB of storage, 1TB of bandwidth and one IP address. Business: 2 core CPU, 4GB RAM, 90 GB of storage, 3TB of bandwidth and two IP addresses. Optimum: 4 core CPU, 8GB RAM, 1200GB of storage, 4TB of bandwidth and two IP addresses. WordPress hosting is becoming more widely available. iPage offers two WP plans. WP Starter: unlimited disk space, bandwidth and email accounts, standard support. WP Essential: unlimited disk space, bandwidth and email accounts. Also gives you WP Experts support, greater speed, enhanced security, and more plugins to choose from. Dedicated hosting offers three plans. Startup: 2 cores CPU, 4GB RAM, 500GB of disk space and 5TB of bandwidth. Professional: 4 cores CPU, 8GB RAM, 1000GB of disk space and 10TB of bandwidth. Enterprise: 4 cores CPU, 16GB RAM, 1000GB of disk space and 15TB of bandwidth. Creating your account is a matter of providing your basic information plus your preferred way of payment—and you’re set to go. You will receive your username and choose a password, which will enable you to log in into your account. The customer portal and control panel are one and the same. On one hand, this is great because you need one less username/password combination. On the other hand, sometimes it’s handy to have your account and website separate. In this case, we don’t have much to complain about. You can access and edit your account information from the drop-down menu titled Account in the upper right corner of the screen. It contains details about account management activities, such as billing, subscriptions and site profile. On the left, you can access Support and Marketplace, a.k.a. MOJO Marketplace. Above that, you will have short black bar where you will access Settings, Help (which takes you to the same place as Support, so a bit redundant) and Logout. However, you will not find security features, such as safety or SSH. They’re not included in the packages and you will have to pay an additional sum for them. The control panel and customer portal are fully integrated. However, control panel options take up most of your screen. You‘ll have the standard set of tools, minus some like chron jobs and auto responders. Sure, you have MOJO marketplace for that, but some tools should be the part of the standard set of tools. Tabs are in a standard format, one below the other, but you’ll also have a drop-down menu for each of them up on the green menu bar. They are as follows: Home (in a form of a house icon), Website, Email, Domain, Google, Marketing and Additional Tools. It’s handy to have them in this layout, instead of having to scroll up and down all the time. Look for Favorites at the top of the screen. On the right, you’ll find a few windows with shortcuts and some ads. Below that are your website statistics. If you are a DIY type, you will have FTM and file manager to work with. If you want to start from scratch online, you can choose from Website Creator and Weebly website builders, and goMobi mobile site builder. If you just want to log in and choose a template, you can always rely on WordPress. However, there are many more options and scripts if you use MOJO marketplace. It’s not an unfamiliar or complicated place, but it would be nice if we had more options with fewer steps as a default setup. When creating your email, you‘ll be asked for a username and password. Oddly enough, you won’t be asked to select the size of your mailbox. That’s because you’ll be limited to 500 MB of mailbox space. Although this can be enough for many small businesses, we think that each customer should be able to decide how they will use their storage space. One nifty thing during creation of the inbox is that you can choose to have standard email, or you can set it up to forward to the email you use most frequently. If a lot of people are opting to forward their email, this could explain the mailbox space limitations. If you choose webmail, you’ll be stuck with default option, Open-Xchange software. Not that it doesn’t do the job well, but it surely isn’t the prettiest belle of the ball. There are also SquirrelMail and AtMail, but you will have to dig for them in the control panel settings. During our uptime test, we only had one downtime that lasted for 14 minutes. Ok, that may not be the best thing to happen, but that only reduced the uptime to 99.89 percent. Arguably, that is still pretty darn good uptime, it just isn’t perfect. We know that servers and operating systems sometimes need downtime and repairs, but we also like when things go smoothly. Although iPage is owned by Endurance International Group, their servers aren’t located at the same place as some other well-known hosts. Because of that, iPage didn’t experience the problems with downtime that other Endurance International hosts have had in the past. Our servers were stationed in Burlington, Massachusetts, so we primarily focused on response times in the western part of the U.S. Portland had a wibbly-wobbly response time that fluctuated mostly between 2 and 4 seconds. Palo Alto had a better response, though it, too, ping ponged between 1 and 2 seconds. Ashburn, Virginia tested similarly, with load times fluctuating between a half-second and one second, but it primarily stayed around 600 ms. The worst-case scenario was with Sydney, Australia. Once, it took around 35 seconds for a response. Not great, but we found that to be more the exception than the rule, with an average response between 3 and 4 seconds. As you can see, it’s typical that response time isn’t really a straight line, but more of a squiggly line. As long as it fluctuates under a second or two, we don’t mind (much). The most static response times, around 2.5 seconds, came from Tokyo. Sao Paulo fluctuated between 2 and 3 seconds. 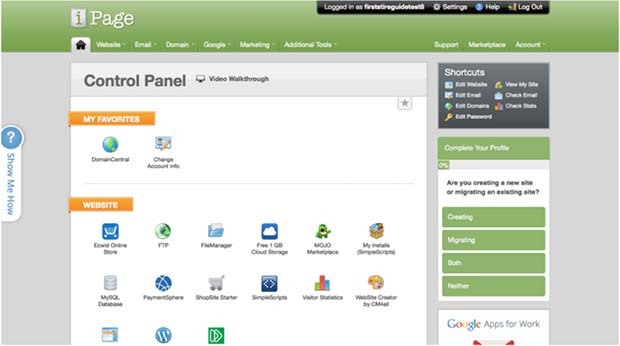 All iPage support options are located under the Support tab in your cPanel. There you’ll be able to access their knowledge base, chat support and ticketing system.The only thing missing are community support/forums. There’s always a reassuring feeling of camaraderie when you can communicate with people in the forums. However, considering that iPage covers the other support methods well, we didn’t feel we were missing something crucial. Ticketing response was standard and chat support is available 24/7. Chat support was quite helpful. Although the response time wasn’t the fastest, it wasn’t that bad—usually under 10 minutes. However, while other hosts may try to upsell you different products and services via email, iPage occasionally pitches services during chat support. Ok, we know hosts must sell to get paid, but we don’t think that trying to sell you something when you’re getting help with a problem is good form. Is it a serious offense? No, not really, but we think they could tone it down a notch and keep upselling out of chat support. iPage often has discounts and introductory rates that are cheaper than the renewal prices, so check their website for current offers. Renewal prices increase from $6.99 to $8.99. These are first-term prices, showing a 20-percent discount. “Term” represents a contract. Contract lengths vary. Renewal rates can go up from $8.49 to $12.49 depending on the length of your contract period. These are first-term prices, showing a 20-percent discount. If you’re on a tight budget, iPage offers some of the lowest introductory rates around or you can use ipage coupon for saving up to 81% when you buy hosting at iPage. It’s great for small businesses and personal websites. However, low rates do not mean that you’ll get poor service. You’ll have plenty of basic features to cover the bases. If you want more, you will have to pay it. And iPage is eco-friendly, to boot.You can read 10 reasons you should buy iPage Hosting then confirm buying iPage. We do take issue with the paid security package. In some basic form, it should be included with all plans. Upselling, too, is a constant—even with chat support. Although we didn’t have many complaints when we tested iPage, there were enough missing pieces that we felt like we were assembling IKEA furniture with a screw missing. In the end, we saw iPage like that nice guy or girl you take on a date. There’s nothing particularly wrong with them, but the spark is missing. They may not be our first choice, but they may be perfect for someone else!